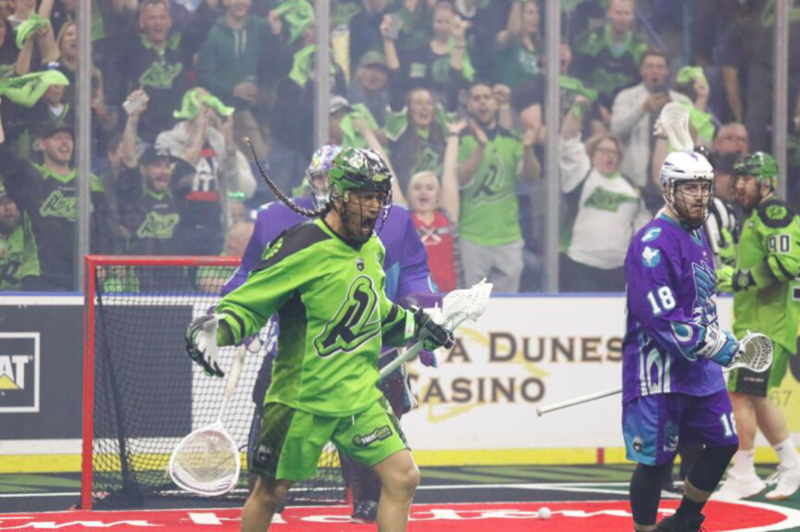 The Saskatchewan Rush threw off any doubts about their dominance on Saturday night with a 16-9 win over the Rochester Knighthawks in game one of the NLL Finals at Sasktel Centre. A seven-goal run bookending halftime knocked the wind out of the Knighthawks, who struggled offensively, who played over 15 minutes in that time without scoring. Rochester had the ball wrestled away from them on offense more than once. It was a positive game for the Rush, as the Knighthawks were the only team they didn’t beat during the regular season. The Rush also expelled any ghosts from the 2017 finals, which they lost two games to none, including a 15-14 home loss to the Georgia Swarm. The Rush are looking stronger than ever. The Knighthawks also had trouble defensively, picking up just 55 loose balls compared to 80 for the Rush. They had no second effort to chase them down. Jake Withers was an impressive 20-for-28 on the faceoff, but the Knighthawks weren’t able to capitalize on the extra possessions. Transition was the name of the game early. With Luc Magnan knocking down Adrian Sorichetti, Graeme Hossack got in alone to tie the game at one at 7:10 of the first quarter. The ’Hawks enjoyed a brief lead before Jeff Cornwall picked up a Mike Messenger rebound to beat Matt Vinc stick-side and tie the game 2-2. Ben McIntosh’s first of the game put the Rush up 3-2 early in the second but the Knighthawks’ special teams put a pair on the board to retake the lead. First, Joe Resetarits scored with an extra attacker, then Cody Jamieson scored off a Resetarits assist. But that was all the luck the Knighthawks had in this game. Robert Church scored shorthanded, beating two defenders to tie the game at four. He scored twice more for a natural hat trick in a span of 3:03 to give the Rush a 6-4 lead at the half. Evan Kirk stopped Austin Shanks point blank before the period ended to prevent the Knighthawks from stealing any momentum back. “It’s definitely a game of momentum and we were able to maintain that momentum,” Cornwall said. The Rush kept the heat on, scoring four times in the first 3:39 of the third quarter to take a 10-4 lead. Vinc was switched briefly (the span of one faceoff win) for Angus Goodleaf, and the respite helped as he shut the door for the next eight minutes. Josh Currier and Eric Fannell scored to cut into the Rush lead, but once again Kirk made a great save to keep momentum, this time on summer teammate Cory Vitarelli, who tried to trick Kirk with a backhand. Marty Dinsdale put the Rush up 11-6 by the end of the third, then assisted on Ryan Keenan’s fourth-quarter opening goal. Fannell scored again, followed by Vitarelli, who slammed home a sharp-angle bounce shot, and the Knighthawks trailed 12-8. Church and Kyle Jackson traded goals in the middle of the frame, but the Rush scored the final three. Vitarelli was stopped by Kirk and Matt Hossack ran down to score at the other end. Mike Messenger made a Herculean effort to stay out the crease on the Rush’s 15th goal. Penalties in the game were even until the fourth quarter, when Billy Dee Smith lost his composure and slashed down Marty Dinsdale before punching at Robert Church. He got in Mark Matthews’ face, too, but the refs jumped in before that escalated. Smith then grabbed at Church again, knocking Church’s helmet off on the way to the box where he was served with three minors, rendering his team shorthanded for six minutes with just 6:18 left to play. Keenan scored the Rush’s only power play goal of the game during that frame. Cody Jamieson led the ’Hawks attack with a goal and five assists. Eric Fannell (2G/2A) and Joe Resetarits (1G/3A) had four points each. Vinc made 48 saves. Church led the Rush with four goals and two assists. Dinsdale scored once and added four assists. Keenan scored three times and Cornwall twice with one assists. Kirk made 36 saves. The Knighthawks host game two next Saturday, June 2nd at 8 p.m. at Blue Cross Arena.